This is very simple, healthy & quick recipe ideal for lunch box for children. Can be substitute for Phulka or Roti !! Desi ghee : 1 1/2 tsp. 1. Add banana pulp in bowl. 2. Add wheat & rice flour into banana pulp. 3. Add fresh coconut, sugar, elaichi powder & ghee. Preserve 1/2 tsp for greasing non stick griddle. Because of ghee you will get nice aroma & brown colour to Dashmi. 4. Add milk as required. Watch consistency. 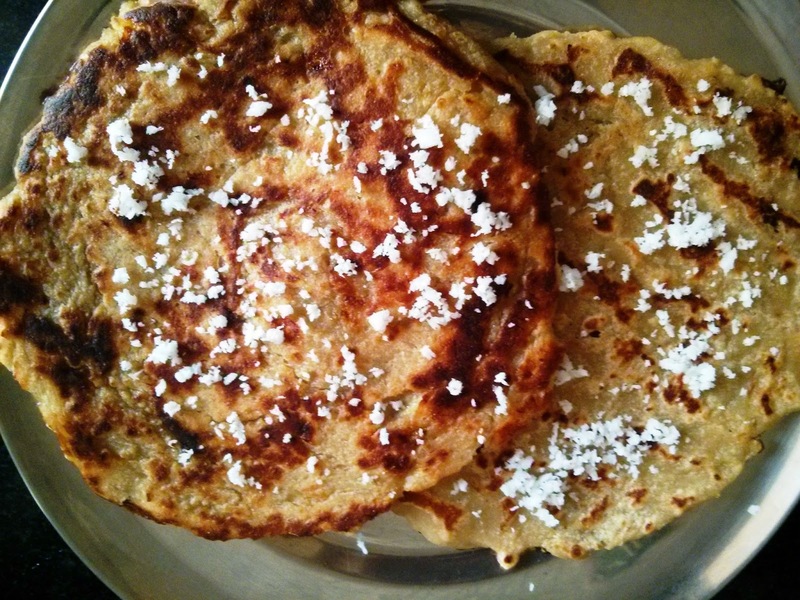 Dashmi is prepared directly on griddle ( tawa). Use non stick Griddle & prepare Dashmi. 5. Decorate with fresh coconut & serve!!! It tastes yummy even if it is not hot ! !